Our Zen Escape vacation package begins with first-class, VIP, private airport pick-up from Juan Santamaria International Airport in Alajuela/ San Jose (SJO). "Relax and enjoy seven days of pampering in the tranquility and natural beauty of Costa Rica"
As you exit the airport, your personal Adventure Tours Costa Rica driver will be waiting for you with your name on his placard just below our logo. Once aboard one of our air-conditioned, top-of-the-line, late model vehicles, we invite you to help yourself to a complementary beer, soda or water from your own personal cooler that awaits you. Feel the relaxation of your vacation taking hold as amazing countryside views roll by on the gorgeous ride from the airport to your luxury oceanfront condo in Jaco Costa Rica. Our professional, bilingual drivers will be happy to answer any questions you may have along the way. Upon your arrival in Jaco, your Adventure Tours concierge will greet and assist your group with condo check-in. In addition, she will provide you with a complimentary local cell phone so that you can relax knowing we are close at hand for your entire vacation in Costa Rica. Adventure Tours Costa Rica’s professional team is on the ground and ready to assist you from the beginning to the end of your Zen Escape vacation package. Upon settling into your elegant and fully-furnished beachfront condo you will find that no luxury has been spared. Our elegant Jaco condos feature modern kitchens, stainless steel appliances, granite countertops, flat panel TVs, cable, wireless internet, washers and dryers, and personal safes. The picturesque balcony views of Jaco and the Pacific Ocean will quickly become the tranquil backdrop for each new day of your relaxing Zen Escape in paradise. Day two of your Zen Escape vacation package begins as your car and driver arrive at your luxury ocean front condo to whisk you away on a first-rate hiking tour of Costa Rica’s most famous and beloved nature reserve - Manuel Antonio National Park. Your certified naturalist guide will take you on the ultimate guided tour of Manuel Antonio’s primary and secondary rainforest which are home to over 109 unique species of mammal and over 184 species of rare birds. Surround yourself with the serenity of unspoiled natural flora and fauna, the gentle sounds of exotic animals and the relaxing splendor of three immaculate white sand beaches as you weave your way through the Costa Rica national park. You can spot monkeys, exotic birds, lizards, sloths and more along the way. On day three of your vacation package, your driver arrives to whisk you away to a beautiful luxury catamaran headed for the famous Tortuga Island. When you arrive at the dock, you will be welcomed aboard by the professional staff and head out on your full-day private cruise to Tortuga Island. Help yourself to a delicious beverage and some refreshing snacks as you take in the amazing Pacific views on this peaceful ride. You will have the chance to see dolphins and even humpback whales along the way. Once you arrive at Tortuga Island, your group will enjoy a delicious lunch as well as a variety of activities including snorkeling, kayaking, a banana boat ride, or simply warming yourself in the warm Costa Rica sun. Day four of your Costa Rica vacation kicks off with a firsthand chance to see why Animal Planet and National Geographic can’t get enough of our native mangroves. Climb aboard the mangrove river boat and slowly glide down the Rio Tarcoles - home to over 2,000 of the largest crocodiles in Costa Rica. Our expert guides and crocodile handlers will amaze as they closely interact with these incredible reptiles - their intention is both to thrill and educate. The Rio Tarcoles mangrove is also a bird-watcher’s paradise, with a stunning variety of extremely rare birds. Do not forget to bring your cameras! Your vacation package continues with the pampered relaxation of a professional hour-long, in-condo massage. Our Adventure Tours Costa Rica licensed team of professional masseuses use only natural local oils and lotions for a truly relaxing and eco-friendly Costa Rican spa experience. This is a free day, nothing to do but relax by the pool on day six of your vacation. Bask in the sun, pamper yourself with a spa treatment at the near-by Los Suenos Resort, or go for an amazing yoga class. On the 7th day of the Zen Escape Costa Rica vacation package, your personal car and driver will arrive at your condo to deliver you to SJO for your flight home. Though you may not want to leave, the deep relaxation and renewal that you have experienced during your seven day retreat will leave a lasting impression that you will remember for years to come. 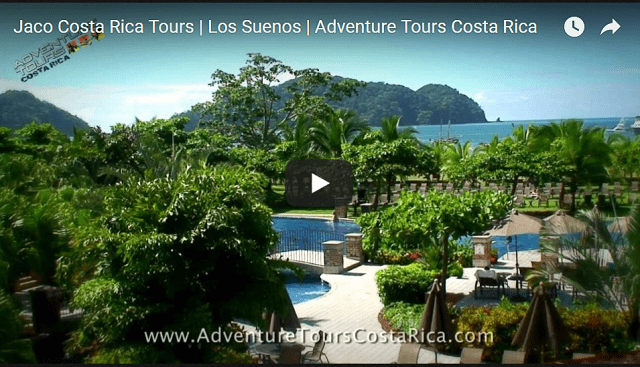 To reserve your Costa Rica vacation package, please contact one of our agents today. "Best vacation EVER! We didn't have a clue about where to stay, what to do, or how to get around in Costa Rica. They took care of everything - beachfront condo, amazing tours, super pro service, and the best pricing - we shopped. A++"